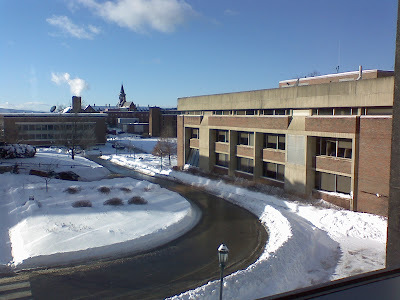 I took this shot during our Monday Staff Meeting from Room 300 at the HSRF building in UVM. The building to the right is the Rowell building which houses the Nursing School. The pointy structure way way off is the UVM clock tower which is one of the landmarks for UVM. By the way, we are facing West towards Lake Champlain.